After abundance of music concerts in Pakistan, we are finally flourishing as our industry is receiving International artists who are swaying in to perform. In this connection, Edward Maya is at the last stages of his comeback in Pakistan. After entertaining the fun-seeker music loving masses of Pakistan in Lahore and Faisalabad, he will be touching pinnacle of his art when he entertains people of Karachi with soft tunes of his music on Saturday. The Romanian music saga will be performing live at Prot Grand Karachi on 18 February 2017 at 8:00 PM. 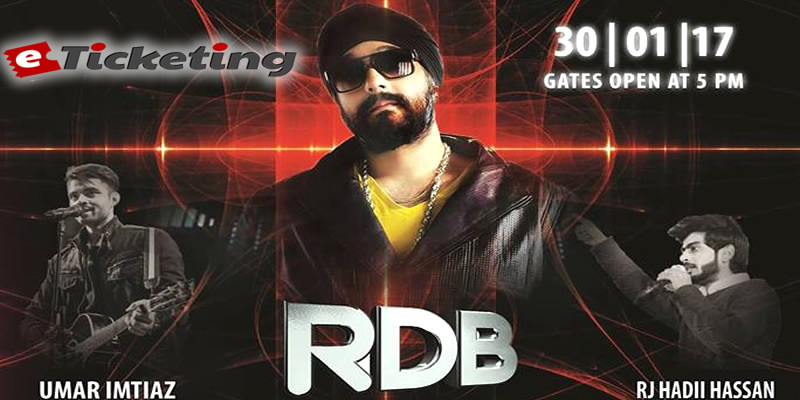 The “Stereo Love” fame will mesmerize the crowd with his sweet voice. One of Pakistan’s top music sensations Zoe Viccajji will also be performing. The comedians Faraz Ahmed and Umar Ahmed will also feature in the concert who will be presenting a stand-up comedy show to amuse the public. This is going to be an entertainment brimming night satiating the thirst of music, comedy and food lovers. It will bring melodies of music, mirth of comedy and taste of foods under one roof. 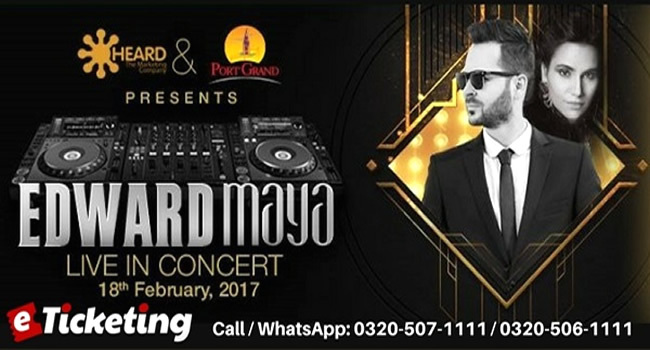 Port Grand is a leisure providing area of Karachi where people tired with nuisances of life can amuse themselves with fun. Port Grand Food and Drink and Entertainment Complex is a core of coastal recreational activities in the city which provides shopping, dining and cultural opportunities to citizens. Raga Boyz belong to 9th generation of Patiala family. They have been carrying on their passion for music since five years. They are sons of living legendary singer Ustad Hamid Ali Khan. They have been representing Pakistan around the globe. Now they are coming to perform in Kinnaird Music Fest in Kinnaird College for Women, Lahore. They will be entertaining music lovers on Fri, Feb 17, 2017. 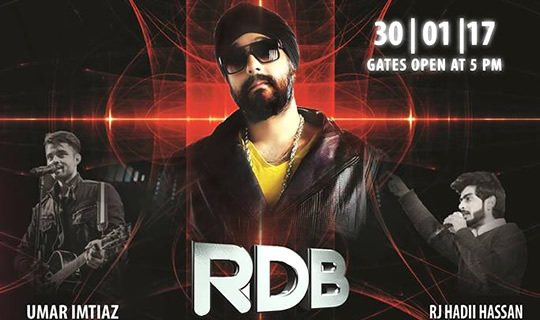 Kinnaird Music Fest is a music event which will be held in Kinnaird College for Women in Lahore. 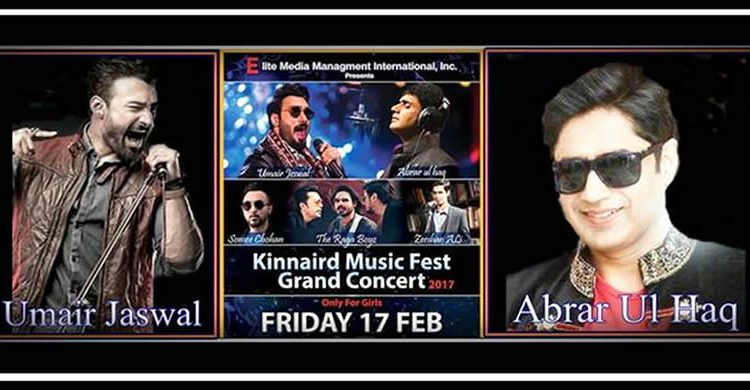 Besides Raga Boyz, Abrar ul Haq, Umair Jaswal Zeeshan Ali and Somi Chohan are also coming to perform in the Kinnaird Music Fest Grand Concert 2017. 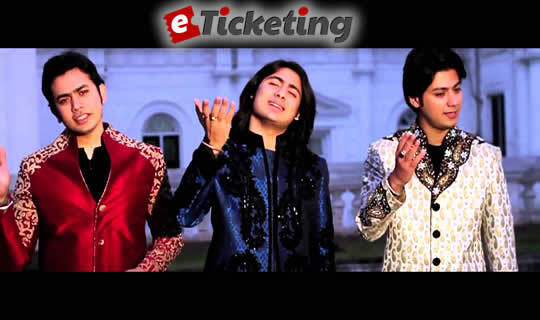 Some of their hit songs are “Ankhoon Se Ankhein”, “Chanda Sooraj”, “Dholna” and “Yeh Jaan Lo”. The tiresome sessions of Riyaz and phenomenal creativity helped them to a unique style. They dub their journey so far full of learning. As the 9th generation of Patiala family, they carry on the legacy. This four brother’s band mix the classical music with today’s modern singing, while retaining their ancestor’s great contribution in eastern music. Winning various titles and competitions internationally, they have performed around the world and gained love from their fans. Raga Boyz sing in all kinds of music like pop, rock, pop rock, Rnb, heavy metal rock, Sufi music, classical fusion etc but they base every genre on classical music. They have performed so far in 18 states of USA in 2005 and 2006, Canada in 2006, China 2007, India 2008, Australia, Saudi Arabia and UAE in 2010 and in Bangladesh in 2009. Uzair Jaswal is a singer, lyricist and actor from Pakistan. He is member of the triangle of the Jaswal brothers who are famous stars of the entertainment industry of Pakistan. His coming performance is in Kinnaird Music Fest in Kinnaird College for Women, Lahore. He will be singing live in the event on Fri, Feb 17, 2017. Kinnaird Music Fest is a music gala which is going to be staged in Kinnaird College for Women in Lahore. 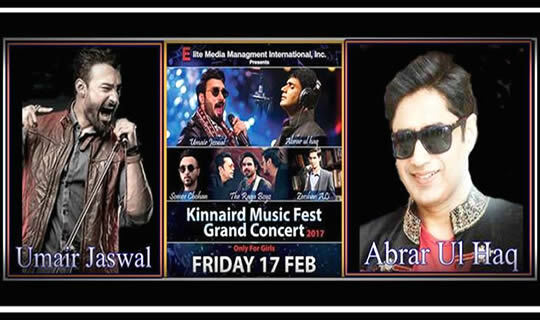 Besides Umair Jaswal, Abrar ul Haq, Raga Boyz, Zeeshan Ali and Somi Chohan are also featuring in the Kinnaird Music Fest Grand Concert 2017. Uzair, who started his career at the age of 19, was able to get himself recognized in the Pakistani music industry in a very small period of time. Some of his famous tracks are “Tere Bin”, “Jaanvey”, “Bolay” and “Yaheen”. His song “Nindiya Ke Paar”, featured in Coke Studio, became a huge success, multiplying his fan base exponentially. He was the youngest singer of Coke Studio Pakistan at the moment. Adding to his versatile talent, he branched out into acting. He has acted in three Pakistani movies, Gol Chakkar, Slackistan and Jalaibee. Jaswal made his entry in Bollywood with playback singing in the film Ek Paheli Leela in 2015. He sang the track “Tere Bin Nahi Laage”, which was a remade version of his earlier hit, “Tere Bin”. Abrar-ul-Haq is a Pakistani pop, bhangra, and folk singer, musician and lyricist. His name appears simply as Abrar on first of his album “Billo De Ghar”. He was born in Narowal. He is one of the most educated singers of Pakistan music industry. He was a Geography teacher at the Aitchison College in Lahore before becoming a singer. He is coming to sing in one of the most prestigious education institutes of Pakistan, Kinnaird College for Women Lahore. 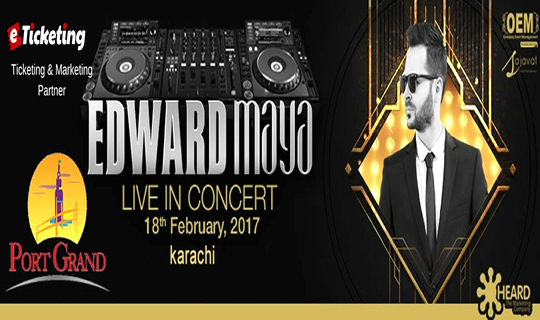 He will be live in the Kinnaird Music Fest which will take place on 17 February 2017. 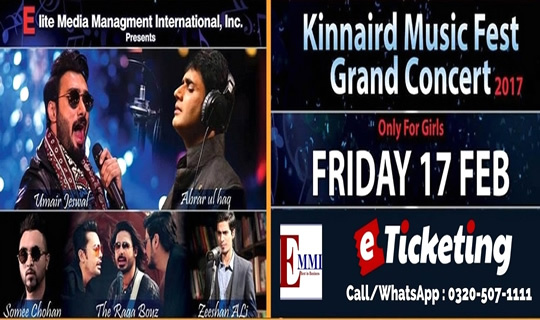 Kinnaird Music Fest 2017 will be organized by Elite Media Management International. Dhol performance, Dance performance and much more Entertainment acts add to the scintillating of the event. Umair Jaswal, Raga Boyz, Zeeshan Ali and Somi Chohan will be performing along with Abrar-ul-Haq in the event. He completed his primary and secondary education in Rawalpindi and Gujrat. His Bachelor’s degree was completed in Sir Syed College Rawalpindi. He received his Master’s degree with Masters in Social science from prestigious Quaid-i-Azam University Islamabad. After that he began teaching in Aitchison College which is one of the most established institutes of Pakistan. But soon he came to know that singing was in his soul and started working on his first album. He started his singing career with launch of his first album billo de ghar in 1995. “Billo de Ghar” was one of the most hit songs of that album. He reached the heights of fame with his debut album. Success of his first album encouraged him to release his second album Majajni in 1997. He released his third album bay ja cycle te in 1999. His fourth and fifth albums Asaan jana mall-o-mall and Nachan main audhay nall nall were released in 2002 and 2004. His latest album naara sadha ishq aey was released in March 2007. Trip To Cholistan Jeep Rally is an exciting piece of escapade for the people who seek adventures of a desert. Cholistan Desert Jeep Rally is a two day tour that will happen on 10 and 11 February 2017. A private adventure company, North Explorers which tends to motivate the people to explore the natural beauty of Pakistan, is organizing the rally. Day One: Departure will take place at 12:00 am from Lahore and arrival time at Bahawalpur is 06:00 am. Breakfast will be served at 7:30 am. 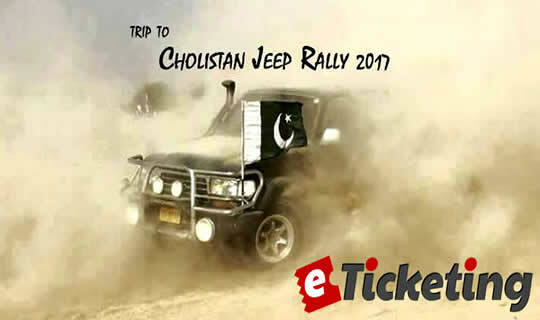 Participants will witness the Cholistan Jeep Rally after arrival at Cholistan Desert at 9:00 am. Then Derawar Fort will be visited. The day will conclude with Bonfire with BBQ and Musical Night with Fireworks and Sky lentern with night stay in camps at the end. Day Two: The second day will start with breakfast at 08:30 am. Departure for Bahawalpur will take place at 11:00 am. Trip will arrive at Bahawalpur at 1:30 pm and if time permits, a visit to the Sadiq Palace will be made on the way. Then Noor Mahal will be visited before departure for Lahore at 03:30 pm. Dinner will be served on the way. Finally arrival at Lahore will take place at 10:00 pm. Food (Breakfast, Dinner), Traveling Cost, Toll Taxes, Camping (3/4 persons on Sharing basis), Tour Guides and Basic first aid kit are included in the services while Lunch, Entry Tickets,Tea, Mineral water and Cold drinks expense, Extra expenses due to the acts of nature and political reasons etc. and any item not mentioned above are not included in the services. Azauj is an international marital matchmaking forum which renders a reliable service to help people in searching a fitting life partner. It is a revolutionary service for unmarried people looking for marriage, fulfilling the requirements of different communities living across the world. In this respect, our international network arranges bi-monthly meetups and matchmaking events in Lahore, Karachi and London. 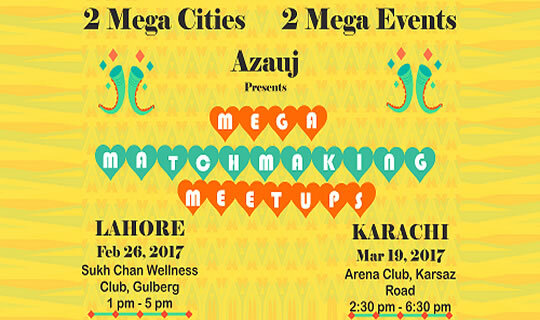 Azauj Lahore Meetup 2017 will take place at Sukh Chan Wellness Club on Sun, Feb 26, 2017 at 01:00 PM – 05:00 PM. First of all fill in the sign-up form on https://www.azauj.com/registration and submit. An email with log in credentials will be sent to you. Call or inbox us and let us know how many seats/tickets you want to book. We give you a unique, personal Event ID number after you have purchased your ticket and your profile is submitted. Your profile is posted on Azauj Website and Facebook page with reference to that number without your name, picture and contact number. Call or inbox us about their ID numbers. We try to arrange seat of that profile’s candidate in our seating arrangement. Interested ones can contact organizers or buy tickets online. Kinnaird Music Fest is a music fiesta which is being held at Kinnaird College for Women in Lahore. Kinnaird Music Fest 2017 will be staged on 17 February 2017. Abrar ul Haq, Umair Jaswal, Raga Boyz, Zeeshan Ali and Somi Chohan will be performing live in the Grand Concert Kinnaird Music Fest 2017. Abrar ul Haq is coming to Kinnaird College with setting his footsteps with tunes of “Assan Jana Mall o Mall”. Music fans can go in bhangra mood when he sets fire to “Nach Punjaban” and more over they can amuse themselves with taking a ride of “Bay Ja Cycle Tay”. Some of his hit songs are “Billo De Ghar”, “Majajani”, “Bay Ja Cycle Tay”, “Assan Jana Mall o Mall”, “Nach Punjaban”. People, who have seen Umair Jaswal acting in film and television and are fans of his singing as well, can watch him spreading melodies among music maniacs. But he will not be ‘Tanha’ when he performs his popular song as a throng of music lovers will be present to cheer him. 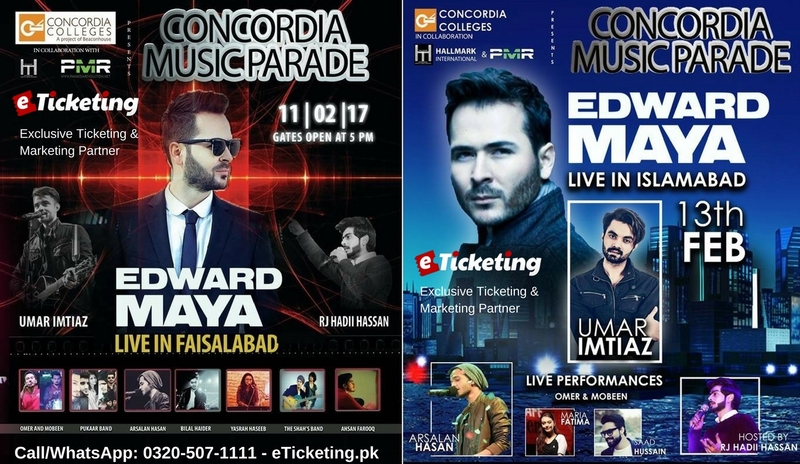 Kinnaird Music Fest 2017 is being organized by Elite Media Management International. This show will be highly managed and will cater full entertainment. Despite live singing, Dhol performances and Dance performances and much more entertaining acts will also be part of the concert. Rhythm Dhol Bass has worked hard in turning out to be one of the leading Producers, Musicians, Singers and Entertainers of South Asia in the world. It was initially started by three Punjabi Sikh brothers Kuly, Manj and Surj in 2000 who were brought to music at a young age by their father who made them sing religious songs with playing the harmonium in their Gurdwara (Temple). 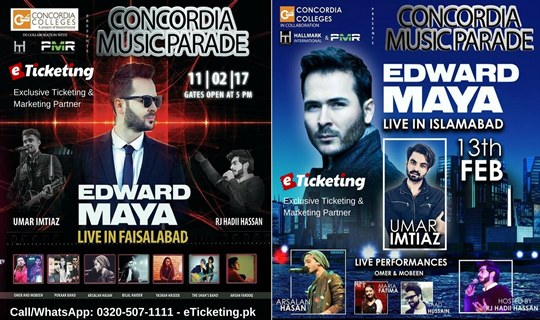 Music lovers can watch him singing live featuring Umar Imtiaz and RJ Hadii Hassan in Concordia Music Parade to be staged on Monday, 30 January 2017 from 5 PM to 10 PM at Alhamra Cultural Complex (Gaddafi Stadium) Lahore. With the untimely demise of their eldest brother Kuly in 2012 and Manj’s exit to carry a solo career in early 2014, SurjRDB now runs the Rhythm Dhol Bass team collaborating even more rocking performances and music. Rhythm Dhol Bass was founded to introduce to audiences around the world a new genre of music fusing different styles of music and genres together and tying it all with South Asian influences. Each member of Rhythm Dhol Bass is a passionate performer and entertainer who has worked along with several celebrity singers and actors not only in the East but also in the West. Akshay Kumar, Saif Ali Khan, Snoop Dogg, Ludacris, T-Pain, Public Enemy are only a small number of them. From millions of viewers to internationally televised shows, to sellout Rhythm Dhol Bass performances around the world, their unique style has no doubt struck a chord with great number of music lovers in the east and west.The music is innovative and goes with deep meaningful lyrics along with hook lines and anthem-like tunes that mix across genres. Rhythm Dhol Bass has made a global fan base of millions from all ages and backgrounds since its initial release in 2001.